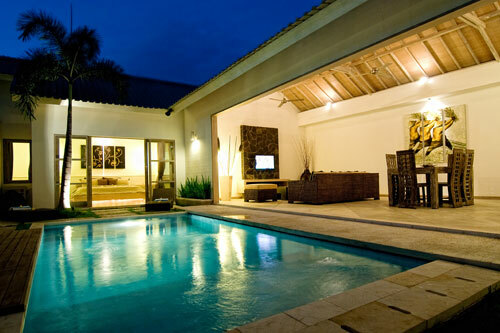 Located in fashionable Seminyak, the Anakula Villas Bali are located in a prime area at the very heart of Southern Bali's main attractions and points of interest. Seminyak double six beach has daily spectacular sunsets and is only a few hundred meters from Anakula Villas Bali. Seminyak is also a world class shopping, eating and nightlife destination with some of Asia's best restaurants, bars and discotheques offering a great value for your money, all of this is within walking distance of Legian Seminyak Street. - Kitchen facilities - Stove, Microwave, cutterleries. Rates do not include breakfast. Long term rate is available upon request. December, January, April, July, August, September. Minimum stay: LOW season: 4 nights; HIGH season: 4 nights; PEAK season: 4 nights.